CompTIA offers some of the most recognized entry-level certifications for IT professionals, including its A+, Network+ and Security+ Certifications, etc. Passcert provides latest and valid CompTIA Certification exams guide to help you get started with CompTIA's certifications and career paths. Rather than categorize certifications by skill-level (Foundation, Professional, Master and Specialty), CompTIA certifications are now grouped by skill set. Currently, CompTIA certs fall info four areas: Core, Infrastructure, Cybersecurity and Additional Professional certifications. 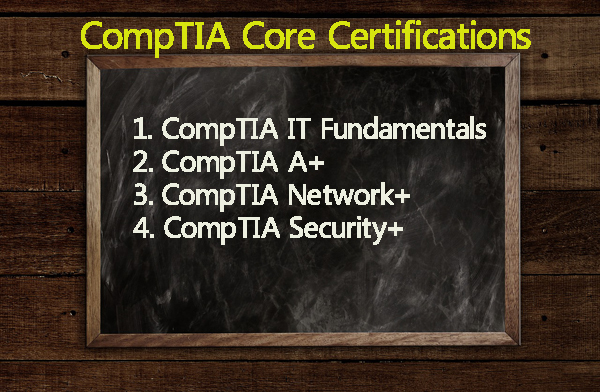 Core Certifications – Designed to build core foundational skills, CompTIA offers four Core certifications: IT Fundamentals, CompTIA A+ (focused on user support and device connectivity), CompTIA Network+ (targeting core system connections with endpoint devices), and CompTIA Security+ (focused on entry level cybersecurity skills). 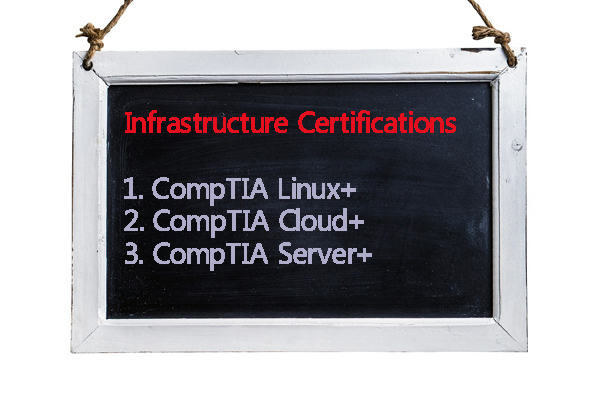 Infrastructure Certifications – Designed to complement the Network+ credential, you’ll find three Infrastructure certifications: CompTIA Server+ (focused on issues related to server support and administration), CompTIA Cloud+ (covering hybrid cloud, virtual system administration and deploying network storage resources), and CompTIA Linux+ (focused on Linux operating system administration and management. Cybersecurity Certifications – CompTIA offers three cybersecurity credentials: CompTIA CySA+ (CySA stands for Cyber Security Analyst, and targets IT security behavioral analysts), CASP (CompTIA Advanced Security Practitioner; focuses on professionals who design and implement security solutions), and the CompTIA PenTest+ (Penetration testing, targets professionals who conduct penetration and vulnerability testing). 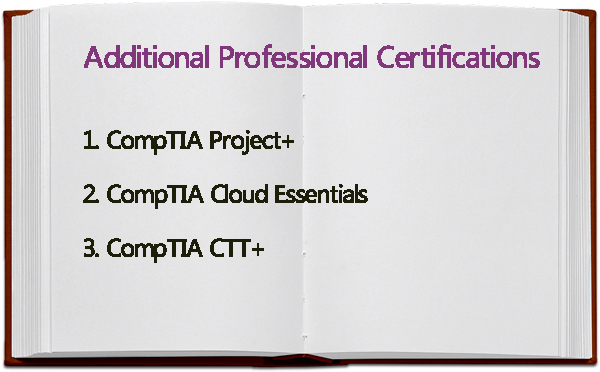 Additional Professional Certifications – This category includes several credentials which don’t readily fit into any of the other CompTIA career paths, including: CompTIA Project+, CompTIA CTT+ and CompTIA Cloud Essentials. CompTIA IT Fundamentals is ideal for beginners with a basic understanding of PC functionality and compatibility as well as familiarity with technology topics, such as hardware basics, software installation, security risks and prevention and basic networking. It’s also ideal as a career planning or development tool for individuals just beginning their IT careers or seeking to make a career change. A single exam is required to earn the credential. Currently, CompTIA is developing a new IT Fundamentals exam. A firm release date has not yet been established but interested candidates should expect to see this new exam released sometime in the third quarter of 2018. The CompTIA A+ certification has been described as an "entry-level rite of passage for IT technicians," for a good reason. This certification is designed for folks seeking a career as a help desk, support, service center or networking technician, and it covers PC and laptop hardware, software installation and configuration of computer and mobile operating systems. A+ also tests a candidate's understanding of basic networking, troubleshooting and security skills, which serve as a springboard for CompTIA networking or security certifications or those offered by other organizations. According to CompTIA, more than one million IT professionals hold the A+ certification. The A+ is required for Dell, Intel and HP service technicians and is recognized by the U.S. Department of Defense (DoD). Candidates must pass two exams (exams 220-901 and 220-902) to earn the A+ credential. Many IT professionals start with the A+ certification. However, if you have the experience and don't feel a need for the A+, you can move directly to the CompTIA Network+ certification. It’s geared toward professionals with at least nine months of networking experience. A candidate must be familiar with networking technologies, media, topologies, security, installation and configuration. The Network+ certification is recommended or required by Dell, HP and Intel, and is also an accepted entry-point certification for the Apple Consultants Network. The Network+ credential meets the ISO 17024 standard and just like the A+, it is recognized by the U.S. DoD. A single exam is required to earn the certification. A new exam, N10-007, was introduced in March 2018. The predecessor exam, N10-006, retires on August 31, 2018. CompTIA Security+ covers network security concepts, threats and vulnerabilities, access control, identity management, cryptography and much more. Although CompTIA does not impose any prerequisites, the organization recommends that cert candidates obtain the Network+ credential and have at least two years of IT administration experience with a security focus. To obtain the Security+ certification candidates must pass on exam, SY0-501. The CompTIA Linux+ Powered by LPI certification aims at Linux network administrators with at least 12 months of Linux administration experience. Such experience should include installation, package management, GNU and Unix commands, shells, scripting, security and more. The A+ and Network+ certifications are recommended as a preamble to this certification, but are not mandatory. Candidates must pass two exams (LX0-103,LX0-104) to earn this credential. As the cloud computing market continues to grow by leaps and bounds, the CompTIA Cloud+ certification has been keeping pace. This certification targets IT professionals with two to three years of experience in storage, networking or data center administration. A single exam, CV0-002, was released in February 2018. It tests candidates' knowledge of cloud technologies, hybrid and multi-cloud solutions, cloud markets, and incorporating cloud-based technology solutions into system operations. CompTIA Server+ aims at server administrators with 18 to 24 months of experience with server hardware and software technologies and the A+ certification is recommended. The Server+ credential is recommended or required by HP, Intel and Lenovo for their server technicians. It is also recognized by Microsoft and the U.S. DoD. A single exam, SK0-004, is required to achieve this credential. As cybercrime increases, the requirement for highly skilled information security analysts will continue to rise. The Bureau of Labor Statistics (BLS) reports anticipated growth of 18 percent for information security analysts between 2014 and 2024, the fastest rate of growth for all occupations. 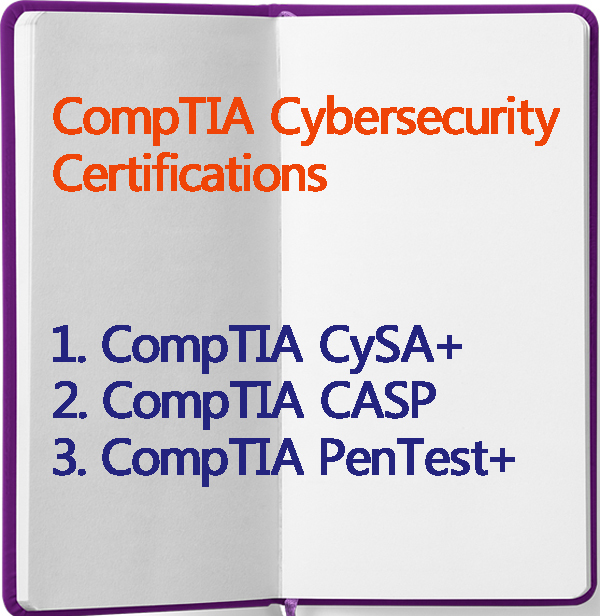 One of the newer additions to the CompTIA certification portfolio is the Cybersecurity Analyst (CySA+) certification. Formerly known as the CSA+, the CySA+ credential is specifically designed to meet the ever-growing need for experienced, qualified information security analysts. CompTIA chose to change the acronym from CSA+ to CySA+ (exams and content remain the same). The rollout on the acronym change should be complete by June 29, 2018. CySA+ credential holders are well versed in the use of system threat detection tools, as well as the use of data and behavioral analytics to secure applications and systems from risks, threats and other vulnerabilities. CySA+ certification holders are not only able to monitor network behavior but analyze results and create solutions to better protect against advanced persistent threats (APTs), intrusions, malware and the like. CompTIA describes CySA+ as a bridge certification between the Security+ credential (requiring two years' experience) and the master-level Advanced Security Practitioner Certification (CASP) credential, which requires 10 years of experience. To earn the CySA+, candidates must pass a performance-based exam CS0-001. While CompTIA no longer uses the “master” designation, the highly sought-after CASP certification is most certainly a master-level credential. Targeting practitioners, the CASP is the only performance-based, hands-on certification currently available from CompTIA. This certification is designed for seasoned IT security professionals who plan, design and implement security solutions in an enterprise environment. Although this certification doesn't impose any explicit prerequisites, it's not a bad idea to earn the Network+ and Security+ certifications before tackling the CASP exam. You should also have 10 years of IT administration experience, as well as a minimum of 5 years of technical security experience (thus securing this certification's place as a “master” credential). Booz Allen Hamilton, Network Solutions and Verizon Telematics, among other companies, require CASP certification for certain positions. The U.S. Army and U.S. Navy also accept CASP as an industry-based certification required by employees and contractors who perform IT work in DOD data centers. The CASP certification requires that candidates pass the CAS-003 exam (launched on April 2, 2018), which consists of 90 multiple-choice and performance-based questions. The newest additional to the CompTIA certification family is the CompTIA PenTest+. An intermediate level credential, PenTest+ is designed to complement the CySA+. While CySA+ is defensive in nature (focusing on threat detection and response), the PenTest+ credential is offensive, focusing on using penetration testing to identify and manage network vulnerabilities across multiple spectra. There are no mandatory prerequisites but the Network+ and Security+ (or equivalent skills) is highly recommended along with a minimum of two years of information security experience. Candidates pursuing the Cybersecurity career path may take the PenTest+ or CySA+ credential in any order. The PT0-001 exam is currently in beta and includes both hands-on as well as performance-based questions. The final exam is scheduled to be released in the third quarter of 2018. The CompTIA Project+ certification focuses exclusively on project management and is ideal for project managers who are familiar with project lifecycles from planning to completion, who can finish a project on time and under budget. Project managers interested in this certification should have at least one year of project management experience overseeing small- to medium-sized projects. The Project+ credential requires that candidates pass a single multiple-choice exam, PK0-004. The CompTIA Cloud Essentials certification is geared toward individuals who understand the business aspects of cloud computing and how to move from in-house to cloud storage. In addition, they should be familiar with the impacts, risks and consequences of implementing a cloud-based solution. A single exam CLO-001 is required to earn the credential. The CompTIA Certified Technical Trainer (CTT+) certification is perfect for anyone interested in technical training. It covers instructor skills, such as preparation, presentation, communication, facilitation and evaluation, in vendor-neutral fashion. Adobe, Cisco, Dell, IBM, Microsoft and Ricoh all recommend CTT+ to their trainers and accept it in lieu of their own in-house trainer certifications. Two exams are required for the CTT+ credential: CompTIA CTT+ Essentials (TK0-201) and either CTT+ Classroom Performance Trainer (TK0-202) or CTT+ Virtual Classroom Trainer (TK0-203). The CTT+ Classroom Performance Trainer and CTT+ Virtual Classroom Trainer are performance-based exams. In this case, you must submit a video or recording of your classroom or virtual classroom sessions and complete a form that documents your training preparation, delivery and student evaluations. Passcert offers you the latest CompTIA A+, Linux+, Network+, Server+, Security+ exams dumps to help you get certified easily, all questions and answers are collected from real test and it can help you pass your exam easily, all CompTIA dumps are offered in pdf and software version for you to study and help you get your CompTIA Certification successfully.